DIY charcoal mask is a quick homemade face mask recipe to help reduce puffiness, acne, and blackheads while nourishing the skin. 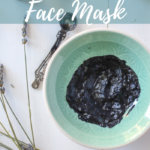 This homemade activated charcoal mask are great for drawing out impurities and toxins from the skin and is great for acne. Follow my tips below when making this awesome homemade charcoal mask. There is nothing like a good ‘ole face mask in my opinion. At least once a week I like to do some self care and usually for me that means a nice long relaxing shower, a body scrub, and a face mask. 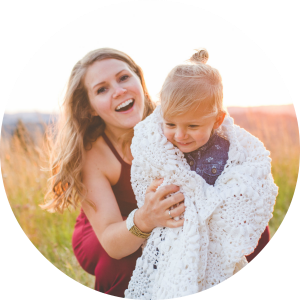 As a mom of two young kids, I need at least a half an hour a week to focus on myself. You know being able to think without interruption… I used to feel selfish wanting to spend time alone, but you cannot fill other people’s cup when you are running on empty. Raising kids is not for the faint of heart, but gosh those little people are fun. But this momma also needs some peace and quiet so she doesn’t go insane. Okay? Thanks! But homemade face mask helps me focus on the care I need, even if it is such a short time. Why you should make your own homemade face masks. As you may know, I have this thing for being cheap. Why buy a product when you can make it for pennies, like for real… pennies. Also, many store-bought face masks contain harmful chemicals and synthetic ingredients that we try to stay away from. Oh the years I spent slathering my face with non-natural products and wondering why my skin looked awful and always broken out. Little did I know that switching to a real food diet and natural products would change my skin so drastically. Find some of the ingredients in your local grocery stores bulk bin section. You can find great prices on things like bentonite clay and activated charcoal and buy small amounts. If you don’t have coffee on hand you can leave it out, but coffee is really beneficial. Be careful not to inhale any activated charcoal dust. It is not good for your lungs. Activated charcoal may be difficult to get completely off your skin. No worries, I promise it does come off. Use a face scrub to help. Do the activated charcoal mask before taking a shower. It is less messy and easier to get off. Don’t wear white when using this mask. Activated charcoal: helps remove dirt, toxins, oils, from your skin. It can also help reduce acne and blemishes by absorbing grime from your pores (source). Bentonite clay (like this one): reduces inflammation, removes toxins from pores, and can help reduce acne scars. Coffee: caffeine can help reduce puffiness and help tighten skin. It is one of my favorite skin care products. Jojoba oil (like this one): is a moisturizing oil that also has antibacterial properties to help fight against acne. It also contains antioxidants, may help reduce scars, and may reduce fine lines and wrinkles (source). Basically jojoba oil is your BFF. Vitamin e oil: is an antioxidant that can help block free radicals and reduce the appearance of aging. Essential Oils: Use your favorite skin loving essential oils like Frankincense, lavender, melaluca, etc. 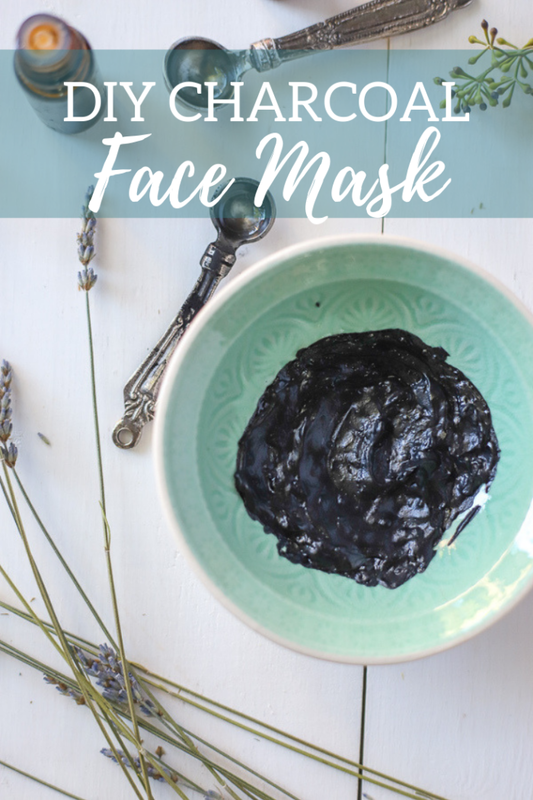 How do you make a homemade charcoal mask? 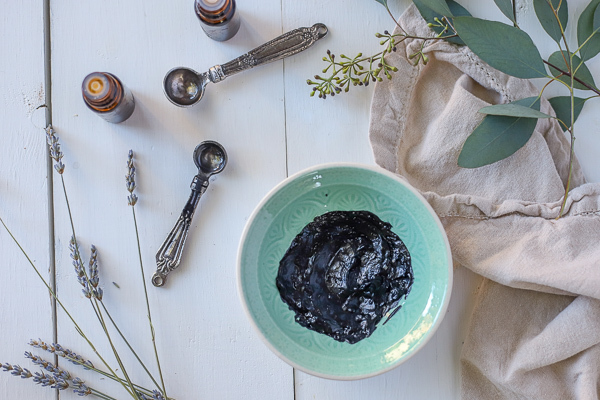 In a non-metalic bowl, mix the bentonite clay and activated charcoal together. Add in coffee, jojoba oil, and vitamin e. Stir well. Add a few drops of essential oils and apply to your skin following directions below. Start with clean skin. Remove makeup and wash face if not already clean. Rinse face with warm water and apply mask with finger or brush. Allow mask to dry and wear for 20-30 minutes. Rinse activated charcoal mask with warm water. Once the majority of the mask is removed follow up with a face scrub to get the remaining mask off. Rinse with water and check to see if you need to follow up with the scrub again. Love homemade products as much as we do? Check out some of our favorite. Coffee face scrub recipe is seriously amazing. It’s my favorite face scrub. I’ve been using this homemade makeup remover for years. Still my favorite product that is dirt cheap. DIY face toner help tighten skin and leave your with clearer skin. Or try this calming herbal facial cleanser. Get the complete guide to sugar scrubs here. 1 tbs prepared coffee – I made a cup of coffee and took a tablespoon of the coffee out then drank the rest. 2 drops essential oils like tea tree, lavender, etc. Mix ingredients together in a non-metal bowl. Starting with a clean face, apply warm water, followed by the mask. Don’t put it near your eyes or on your eyelids. Allow to completely dry, about 20-30 minutes. Rinse with warm water. *This is usually when I start to panic because activated charcoal is difficult to remove. I recommend doing this in the shower. But don’t worry! Once most of it is removed, use a scrub like the one above and gently exfoliate your face. Rinse with water again and wipe with towel. You may need to scrub one more time and wipe. Follow up with toner and your favorite moisturizer. 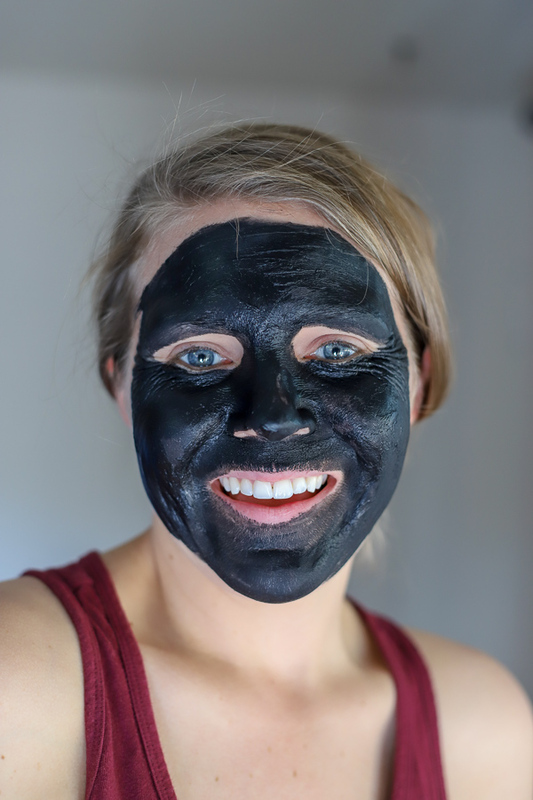 Can I put activated charcoal on my face? Oh yea! It is an awesome addition to your natural skin care products. It can help remove impurities and toxins from your skin and reduce inflammation. You want to be careful and not inhale any of the dry activated charcoal dust, but once it is wet you are fine. You betcha. Activated charcoal masks work well for people with blackheads and acne because it can help unclog pores. It also helps absorb environmental pollutants, toxins, and impurities. It may cause some irritation in some people and shouldn’t be used more than a few times a week. Since this one doesn’t contain gelatin and isn’t a peel off mask it is much less irritating. How many times a week can I use a face mask? You should use a face mask 1-3 times a week according to experts. Using a face mask too often can dry your skin out. So don’t go crazy. Do you love doing some self care and face masks at home? What’s your favorite mask?